There’s countless things that go on behind the scenes for the Kansas City Chiefs that help position the team to win on the field. Every victory is a culmination of numerous people working together to prepare for the upcoming opponent. A critical component of that weekly preparation is the work done by the Chiefs video operations team, which film practice so that the coaching staff can adequately evaluate and game plan. 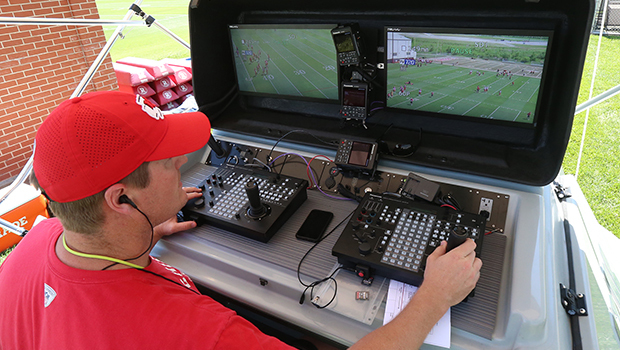 That process got a facelift this offseason, as the Chiefs moved on from the traditional manned scissor-lifts in favor of a new camera system that can be operated from the ground. The Chiefs currently have three of the units, which are produced by a company called 8K Solutions, in what’s considered the latest in the industry. The new system’s primary advantage is safety, as it doesn’t require an individual to actually ascend in the air with the camera. The increased safety of the staff made the decision to move forward with the new technology an easy one for Chiefs Chairman and CEO Clark Hunt. Older Post[PalmBeachPost.com] What’s up with those new video boards at Miami Dolphins practice? Copyright 2017 © 8K, Inc.